Unique Gathering Space for community events restoration identified deficiency of subsurface waterproofing which required full replacement. 2300 granite stones for stairs and benches were removed and replaced for reuse with little wear over 40 years. 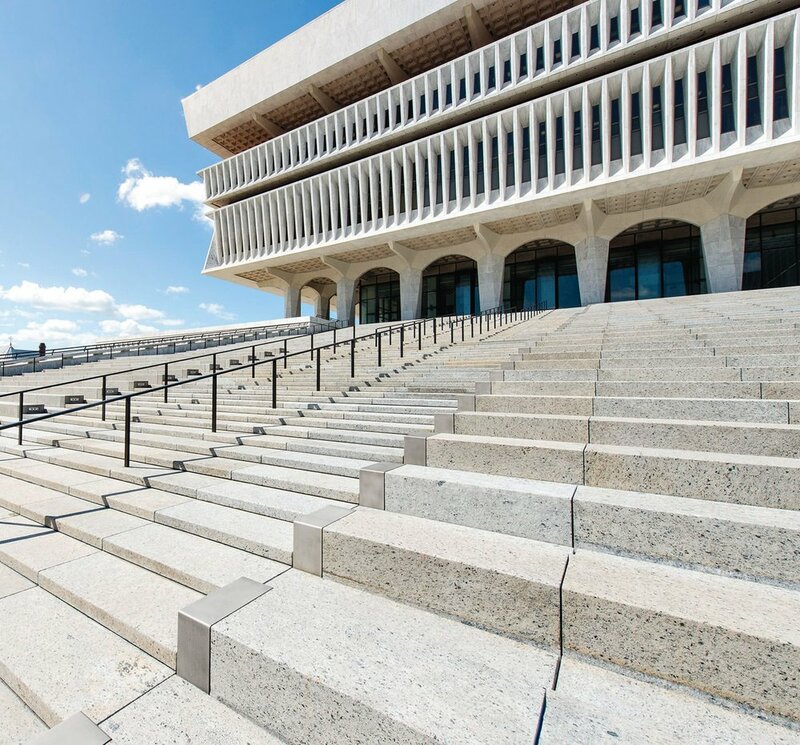 The Grand Stair at the Empire State Plaza extends over Madison Avenue at the south end of a plaza complex, connecting the Main Platform to New York State Museum. The public structure has been in continuous service since the mid-1970s, providing pedestrian access and outdoor seating for concerts, cultural events and 4th of July fireworks. Water leaking though the Grand Stair had resulted in water damage of the ceiling at the south end of the Main Platform concourse and adjacent maintenance offices and TV studio, as well as wintertime icicle accumulation over public sidewalks and pedestrian areas along the avenue. 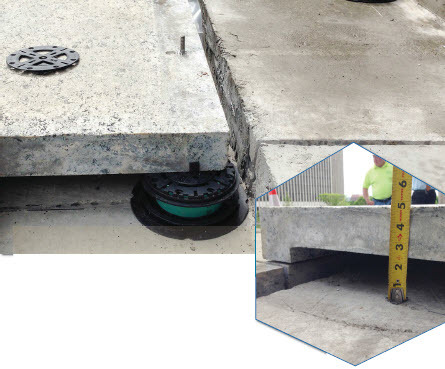 Testing and investigations performed by the New York State Office of General Services identified deficiencies with the existing subsurface waterproofing system, including deficient drainage details and significant amounts of trapped moisture and excessive weathering within the mortar bed and concrete fill above the waterproofing membrane. The $7M rehabilitation included full replacement of the subsurface waterproofing system, utilizing a multi-tier approach to minimize moisture infiltration, extend the life of the subsurface components, reduce maintenance efforts. It also included removal and reinstallation of more than 2,300 individual granite stones that make up the stairs and benches. This hard, durable stone was in excellent condition after 40 years in service. Fewer than 2% of granite pieces required repair or replacement. Granite treads are a minimum of 2 ½" thick and are set on a custom-sized pedestal support system to isolate stone cladding from movements in the structure and minimize flexural stress in existing stones while resisting lateral forces and maintaining consistent joint widths. An assumed flexural strength of 1200 psi was used in designing the pedestal support layout. Existing stone was reset as a rainscreen using customized pedestals and hidden anchor components to improve drainage performance and reduce maintenance. Multi-tier waterproofing system is designed as a rainscreen. Existing granite stones are set on raised pedestal supports that stand the stone wearing surface off of a sealed lightweight concrete fill below, pitched to drain. A secondary drainage layer is provided by installing drainage board directly above the waterproofing membrane below the concrete fill, also preventing moisture from becoming trapped within the concrete substrate. Each distinct layer of the waterproofing system is fully integrated into the drain fixtures. Multiple layers of moisture control establish a predictable moisture path and increase the longevity of the structure. Open joints between stones allow water to flow below the stone units where it can be collected by a drainage system. Surface water cannot pool and collect behind benches and there are no joints to seal or maintain. This is a technically excellent and well-built, thoughtful project. In terms of an understanding of drainage systems it shows a comprehensive understanding. This project re-uses about 98% of the existing stone material. This is a testimony to the integrity of the initial designer’s selection. The Owner’s expectation for a weather-tight restoration that maintains the initial design integrity is well executed. The principal innovation is in re-imagining of the cladding system. The [current design team] are to be applauded for maintaining the integrity of the original aesthetic.